Start empowering your workforce today with Leading Empowered Teams. An easy-to-read, yet comprehensive 105 page Participant Manual containing key concepts about the Leading Empowered Teams program along with thought provoking quotes and interactive exercises. A color certificate with their name on it upon completion of the Leading Empowered Teams program. 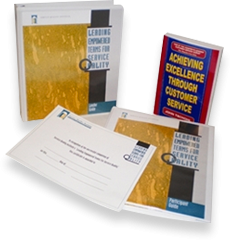 Achieving Excellence Through Customer Service book by John Tschohl. 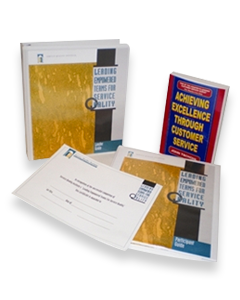 A customer service book for executives, managers and those in leadership positions. In several languages including English, Spanish, Chinese, Russian, Indonesian, Romanian, Arabic, and Portuguese. Leading Empowered Teams can also be translated into other languages. Can be personalized for your organization. An easy-to-read 105 page manual containing key concepts about the Leading Empowered Teams program.